Posted May 24th, 2017 by Anushka Lobo & filed under Dubai. Here is our guide on what to expect if you intend on spending your Ramadan in Dubai, how to learn about it and how to enjoy it fully. Ramadan is observed in the ninth month of the Islamic calendar. Muslims all over the world fast during the day to commemorate the first revelation of the Holy Quran to Prophet Muhammad (P.B.U.H). If you make a genuine mistake, apologize and be sorry. Do not have a poor attitude. YES join iftars and Ramadan tents! Government offices are working form 9 Am till 2 PM. Public transportation like Buses, Abra, metros, tram along with taxi services run at usual timings. All shopping malls are open as usual and close at around 2am in the morning. Most restaurants Offer take away during the day. They offer dine in services only after Iftar at 7 PM. Food outlets inside shopping malls are always open. If you would like to take a quick city tour of Dubai and learn more about the city and its history and culture, do check out our Whet-Your-Appetite-City-Tour. Posted May 17th, 2017 by Anushka Lobo & filed under Dubai. The best time to visit Dubai is during its cooler months i.e. between November and April. The remaining months mainly restrict outdoor activities. Everything else from shopping to shaded sightseeing is possible even when the mercury levels go over 50°C (122°F). This is largely due to the fact that almost every public place in Dubai is air conditioned from malls, hotels to even bus stations. The tourist season is at its peak from November to April when the mercury levels are in between a comfortable 24-35°C (75-95°F), keeping the evenings pleasant and the nights cool. Months from November to February observe gentle winds where the thermometer dips down to almost 14°C (57.2°F). If your lucky you can even experience the occasional rains that occur between January and April. It is advised to take into account the months when the holy month of Ramadan is observed through out the emirate. The month of Ramadan is a particularly good time to visit Dubai if you are interested in experiencing the culture and heritage of the emirate. You can take our Heritage tour of old Dubai to learn about the history and importance of this holy month. (January-February) – It is an annual event generally organized between December and February. Huge Discounts, Mega promotions and numerous live events are the key highlights of the festival. Dubai World Cup (March) – It is one of the most prestigious Thoroughbred Horse Races, organized at Meydan Racecourse. Al Marmoom Heritage Festival (April) – It is a popular Camel Festival, where thousands of well trained camels compete for glory. Gitex Technology Week (April and October) – It is the leading Tech-Fest held in Dubai twice a year. Leading international brands use it as a platform to launch and showcase their new products. UAE National Day (2nd December) – This is the union day between six emirates (later joined by the seventh). This memorable day is celebrated all over the country and Dubai is no exception. Extravagant fireworks, road rallies and traditional dance shows are seen everywhere. The whole plethora of UAE’s history and culture is on display on this momentous day. Dubai International Film Festival (DIFF) (December)- It is the leading film festival in the GCC region, where local talents as well as international stars are in attendance. Art Dubai (March) – It is an international art fair, with a diverse lineup of over 90 galleries from over 40 countries. Dubai International Airport welcomed an incredible 83.6 million passengers in 2016. Of this number, many were transit passengers making use of Dubai’s strategic location between Africa, Asia and Europe. Some layovers are brief affairs, with passengers simply rushing from one gate to the next. Sometimes, however, the passengers get to spend a little more time when stopping over in Dubai. We’ve put together a guide on how to make the most of a short Dubai layover. Before you make the decision to leave the airport, you should look into what your visa situation will be. The citizens of 48 countries, including Australia, Canada, United Kingdom, United States and Germany, can get visas on arrival, which will allow them to easily leave the airport during their layover. Furthermore, Indian passport holders with a valid American visa or Green Card are also eligible for a visa on arrival. To know more about visa and entry in Dubai, and to see the full list of which passports get visas on arrival, click here. If you’re flying on Emirates, you can also look into their Dubai Connect Program, which helps accommodate passengers with long layovers in Dubai. If you don’t want to lug your carry-on throughout the city, you should look into keeping it in short-term storage. Dubai International Airport offers this service in Terminal 1 and Terminal 3 (it is not available in Terminal 2). The short-term storage facility is open 24/7. It costs either AED 20 or AED 25 for every 12 hours, depending on the size of the bag. The Dubai Airport is located close to the city, allowing for people to quickly leave the airport during a layover in Dubai. There are two metro stations by the Dubai Airport – Airport Terminal 1 and Airport Terminal 3. Both of these terminals are connected to the Dubai Metro Red Line. You can check out our guide to travelling by Dubai Metro here. Kindly note that travelling by Dubai Metro involves certain luggage restrictions. Passengers are allowed to carry one large suitcase (< 81cm x 58 cm x 30cm) and one piece of hand baggage (<55cm x 38cm x 20cm). You also have the option of leaving by taxi. The taxi service at the Dubai Airport is very well organized, with a fleet of taxis waiting 24/7. There is an AED 25 flag charge for a taxi leaving from the airport, and charge of AED 1.96 for each km traveled. Below, we’ve suggested a brief one-day itinerary for tourists visiting Dubai for one day. We’ve chosen the below attractions based on their popularity and their relative proximity to the airport. You may have to adjust the itinerary below based on the length of your layover, and the date and timing of your arrival (for instance, some attractions in the Historical district run on reduced hours on Fridays). If you’re in Dubai, we recommend checking out the historical district, known as Al Fahidi. The closest metro station is the Al Fahidi Metro Station, on the Green Line. If you are coming by Metro from Dubai Airport, you will need to transfer to the Green Line at Union Station. When you’ve reached the Al Fahidi Historical Neighborhood, you can see the traditional Arabian architecture, interspersed with an impressive collection of public street art. There are many small museums in this area, which are either free or have a very low entrance fee. We particularly like the free Coffee Museum – if you head up to the second floor, you can purchase a cup of traditional Arabic Coffee with dates. 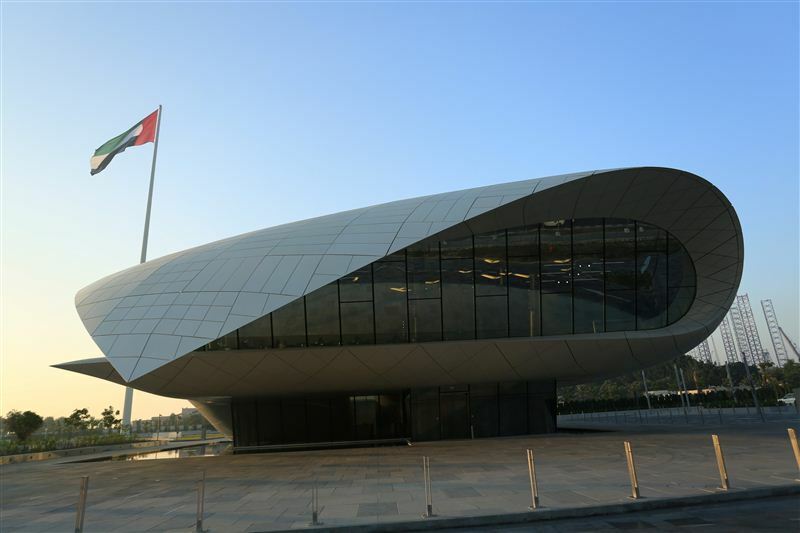 We also recommend checking out the Dubai Museum. It is located in Al Fahidi Fort, the oldest existing building in Dubai. The entrance fee in only AED 3, and it provides a great showcase of what life was like in the region prior to the discovery of oil. Our Historical Dubai Tour will guide you throughout this area and provide you with interesting facts about the region’s heritage. You can head over to the Souqs once your done with the Dubai Museum. The Textile Souk is only a few minutes away from the Dubai Museum, and offers pashminas, carpets, harem pants, embroidered purses and sequined slippers for sale. Once finished, you can head across the Creek via the Dubai Abra (water taxi). It’s the quickest way to get from Bur Dubai to Deira and at AED 1 only, it’s incredibly cheap. When you arrive on the Deira side, you will find yourself in the Spice Market, where you can purchase delicacies like saffron, vanilla & zaatar for amazingly low prices. Be ready to Bargain as haggling is expected. If you wander further along, you will see the glittering Dubai Gold Souk. Here, you’ll find an incredible selection of Eastern and Western jewelry. The pieces here are quite affordable, so if you’re looking for a new trinket, be sure to check it out. In our Old Dubai Tour we will guide you through the different markets in this region and even take you inside the shops to showcase the variety of goods on offer. It is the prefect tour to take during a short layover in Dubai. When you’re done with shopping, head over to Downtown Dubai, to the famous Dubai Mall. The 12 million square feet edifice is one of Dubai’s most popular destinations for tourists and locals alike, with a combination of luxury and fast fashion stores. It also has a great collection of international cuisines, with both fancy restaurants and snack stalls represented. There is plenty to do and see in Dubai Mall even if your not interested in shopping. The Dubai Aquarium, for instance, is spread out over several floors of Dubai Mall and is home to 140 species of sea life. You can purchase a ticket to enter or just admire the view from outside. When you’ve had your fill of the mall, head over to the Lower Ground Level, where you’ll find the entrance of the Burj Khalifa. We’ve written a guide for getting to the top that that you can see here. Remember that tickets sell fast, and unless you are purchasing an immediate entry ticket, tickets have timed entry. Therefore, we recommend booking online, in advance, to avoid disappointment. Most people spend about 1 hour at the top of the Burj Khalifa. When you exit the mall, you’ll be able to see the Dubai Fountain. The Dubai Fountain has a beautiful choreographed show that runs in the evenings from 6:00pm to 11:00pm, every 30 minutes. It also has select afternoon shows at 1:00pm and 1:30pm (except on Fridays, when the afternoon shows are at 1:30pm and 2:00pm). From this area, you can also take some great photos of the Burj Khalifa from the outside. From there, you can cross the walkway to Souk Al Bahar, an stylish shopping and food center. Or, you can wander down the boulevard to look at the public artwork on display. There’s tons to see and do during a layover in Dubai, so it can be difficult to narrow it down to only a few quick highlights. Nevertheless, we think the above one-day itinerary is a great option for someone looking to make the most of a layover in Dubai. If you have any questions on how to plan for your upcoming layover, leave us a comment and we’ll get back to you. Posted May 16th, 2017 by Anushka Lobo & filed under Dubai. Dubai is the go to tourist destination in the gulf region. Tourism industry is almost 42% of the GDP of Dubai. Due to this very reason, Dubai has made its visa policies completely tourist friendly. Dubai tourist visa on arrival is offered to Citizens of over 33 countries. Residents of AGCC member nations don’t require a visa while travelling to Dubai. Such professionals and their self sponsored personal staff can obtain non-renewable 30-day visa on arrival at approved ports of entry. Indian Nationals can obtain visa on arrival if they have a visit visa or green card, issued by USA. This visa is issued for a maximum stay of 14 days and can be extended for an additional 14 days. For this a Passport with at least six months’ validity is required. To know more about UAE visa regulations, feel free to visit the Ministry of Foreign Affairs and International Cooperation website. If you want a quick city tour of Dubai, do check out our Whet-Your-Appetite-Dubai-City-Tour. Planning a Dubai Opera Visit? Posted May 4th, 2017 by Anushka Lobo & filed under Dubai. Though it only opened its doors in 2016, the Dubai Opera has quickly become one of the city’s most treasured cultural jewels. The 1901-seat performing arts center has played host to operatic performances, ice shows, ballet dances, orchestral productions, illusionist acts, musicals and more. In this post, we’ll tell you everything you need to know about visiting the Dubai Opera. Where is the Dubai Opera? To visit the Dubai Opera, you will need to head over to Sheikh Mohammed Bin Rashid Boulevard, in Downtown Dubai. The Dubai Opera is situated close to the Burj Khalifa. If you are traveling by metro, you should take the Red Line to the Burj Khalifa/Dubai Mall metro station. The Dubai Opera is approximately a 15-minute walk away from that stop. You can check out our guide to using the Dubai Metro here. How do I buy tickets to the Dubai Opera? You may visit the Dubai Opera website to purchase tickets online. You can also buy tickets in-person at the Dubai Opera Box Office. The Box Office is located on the Opera Plaza on Sheikh Mohammed Bin Rashid Boulevard and is open daily from 10am to 9pm. How much do tickets to the Dubai Opera cost? The cost of tickets will depend on the show that you wish to see and the location of your seats. Tickets can range from 250 AED (for back row seats) to 7000 AED and over for VIP Box seats. Group bookings of 10 or more may qualify for discounts, depending on the show – visit the Dubai Opera website for more information. What is the seating plan for the Dubai Opera like? The Dubai Opera is built to seat 1901 people. The seating is divided into three main areas – Stalls, Royal Circle and Grand Circle. The pricing within each section can vary significantly (for instance, there is a difference of several thousand dirhams between seating in B reserve and seating in a B1 or B2 box seat, even though they both fall under the “Stalls” Category). Check your pricing carefully when purchasing! How will my tickets be delivered to me after purchase? Printing at Home: Most shows at the Dubai Opera allow you to print your tickets at home. Make sure the barcode is printed clearly on your home-printed ticket. When you arrive at the venue, you will not need to check in with the box-office. Simply proceed to the ushers, who will scan your ticket for entry. For tourists, we recommend printing tickets at home. Mobile Ticketing: Selected shows offer mobile tickets as well. You can hold all of the mobile tickets on your phone (if you plan to arrive as a group), or you can SMS the tickets to each member of your group (if you are arriving separately.) When you arrive, present your mobile ticket to the user for scanning. Note: If you are using this method, make sure you have chosen “Mobile Ticket” when purchasing. If you have chosen the “Print Ticket” option, you cannot enter the venue by showing the PDF of the ticket on your mobile. Collecting from Venue: You also have the option to collect the tickets from the Box Office. To do so, you will require your email purchase receipt, a Photo ID and the credit card that you used to purchase the tickets. If you choose this method, please ensure you arrive early! Lines at the Box Office can be long, and you don’t want to miss the start of the show. Additionally, kindly note that only the person who purchased the tickets can collect them from the Box Office. If you have sufficient proof of purchase and a valid ID, the Dubai Opera should be able to reissue your ticket. You may be charged an administration fee of 30 AED for this process. General admission tickets (with unallocated seating) may not be valid for readmission. What is the dress code for visiting the Dubai Opera? The venue encourages its attendees to dress up. We recommend dressing smartly, in a similar manner as you would when visiting a nice restaurant. What happens if I arrive late to the Opera? All guests of the Opera are strongly encouraged to arrive in plenty of time for the show. guests arriving late are not not permitted to enter the auditorium until there is a break in the performance. This is done to prevent late-arrivers from disturbing the other attendees. Doors to the Opera foyer open 2 hours before the performance. Doors to the auditorium open 30 minutes before the performance is due to begin. Therefore, we recommend arriving early. This will give you a chance to take photos of the architecture, which was designed to resemble a traditional dhow. Do I need a ticket to enter the Dubai Opera? It is possible to enter the Opera house without purchasing a ticket. The doors to the Opera foyer open two hours before a scheduled show starts. You may enter the foyer without a ticket. However, entry to the auditorium will not be possible without a ticket. Afternoon tea at the Burj Al Arab is the best way to spend your afternoon in Dubai. The Burj Al Arab is one of the world’s most luxurious hotels – so luxurious, in fact, it is said to be rated seven stars. The sail-shaped edifice is one of Dubai’s most iconic landmarks and is a must-see attraction for anyone visiting Dubai. However, tourists can’t just walk up to the hotel. One can only access it via a private bridge, as the island itself is 280 m offshore. To cross that bridge, you need to show security that you have business at the hotel. The most popular way for tourists to do that is to book an Afternoon Tea at the Burj Al Arab. Looking to burn the calories after having afternoon tea at the Burj Al Arab? Our Downtown Dubai Walking Tour will allow you to explore by foot the view you see from the hotel. There are three options available for anyone wishing to have afternoon tea at the Burj Al Arab. Sky Tea at the Skyview Bar is the most popular (and most expensive) option. This Bar is located at the top of the Burj Al Arab and guests can enjoy stunning views of the city as they eat. If a table with a view is not a priority to you, you can book one of the afternoon teas at the Sahn Eddar. This restaurant is located on the first floor, so you won’t get a view from the top. However, you can still explore the incredible hotel lobby, with its fountains, aquariums and gold columns. You also have property access, so you can take great photos of the building from the outside. Cuisine: The Sky Tea at Skyview Bar is a seven-course afternoon tea. The delicacies on offer include an extensive selection of teas, coffees, finger sandwiches, French pastries, scones and jams. You will also receive a complimentary glass of champagne. Don’t fear uninspired offerings – past menu highlights include smoked salmon sandwiches, squid ink bread and lychee sorbet, alongside more traditional options like egg salad and the chef’s carvery. Even the drinks menu is extensive – the tea menu alone includes over 20 different options. Cost: AED 620 per person. Window seating costs AED 100 extra*. So, if you and your spouse want to book a table by the window, you would pay AED 1340 in total (620+620+100). Timings: Currently Sky View Bar offers Sky Tea from Sunday to Thursday. You can book tables for one of four seating times – 13:00, 13:15, 16:00 and 16:15. Table seating is valid for 2 hours. Reservations: Reservations are required. Due to the popularity of the Sky Tea, the hotel recommends booking a few weeks in advance. Dress code: The dress code is described as semi-casual. However, we recommend erring on the side of formality. A lot of the appeal of the Burj Al Arab lies in the ambiance, so be sure to dress smartly. Cancellation policy: You must make any cancellations at least 24 hours prior to your reservation time. If you cancel with less than 24 hours’ notice, or fail to show up at all, you will have to pay a fine of AED 300. Cuisine: The Ultimate Afternoon Tea at Sahn Eddar is a seven-course afternoon tea. The menu is nearly identical to the one offered at the Skyview Bar Sky Tea. Guests can choose from a selection of teas, coffees, finger sandwiches, French pastries, scones and jams. Reservations: Reservations are required. Booking a day or two in advance is usually sufficient. Dress code: The dress code is described as semi-casual. However, we again recommend erring on the side of formality, to keep in with the ambiance of the location. Cancellation policy: You must make any cancellations at least 24 hours prior to your reservation time. If you cancel with less than 24 hours’ notice, or fail to show up at all, you will have to pay a fine of AED 200. Cuisine: High Tea at Sahn Eddar is a three-course afternoon tea. The menu is a bit more limited in comparison to the ones offered in Ultimate Afternoon Tea and Sky Tea. The three-course afternoon tea is inclusive of Sandwiches, scones and pastries, as well as cocktails. Reservations: You need to have reservation. Booking a day or two in advance is usually sufficient. Dress code: The dress code is semi-casual. However, we again recommend erring on the side of formality, to keep in with the ambiance of the location. First, it is essential that you make a reservation before visiting the Burj Al Arab. The earlier you can make your reservation, the better, as tables fill up fast. For reservation, call the hotel at +971 4 301 7600. You can also send them an email at BAArestaurants@jumeirah.com.You will have to provide your credit card information for making the reservation and remember to jot down the confirmation code for future reference. On the day of your reservation, you will need to head over to Jumeirah. Once their, you will have to provide security with your confirmation code in order to cross the bridge. Security will only allow you entry 30 minutes before your scheduled afternoon tea time, so while it’s good to be an early bird, make sure you don’t overdo it. The Burj Al Arab boasts stunning interiors. If you reach the lobby about 20 minutes before your scheduled tea time, you’ll have plenty of time to take photographs. Then, either enter the Sahn Eddar restaurant or take the elevator to the Skyview Bar. Last but not least, relax and enjoy your luxurious afternoon tea. The Afternoon Tea is a popular option for tourists, so feel free to take photos of your meal without any self-consciousness. And if you have any questions about your menu (or simply want a refill), don’t hesitate to ask one of the waiters – the service there is out of this world. If you would like to go a traditional Dubai food tour feel free to email us on contact@dubaibyfoot.com. The Burj Khalifa is probably the most iconic building in Dubai’s impressive skyline. At a staggering 828 meters, it is currently the tallest building in the world. No trip to Dubai is complete without a view from the magnificent observation deck. Here’s how you can get to At The Top of the Burj Khalifa. How do I get to At The Top of the Burj Khalifa? The Burj Khalifa is located in Downtown Dubai, right beside Dubai Mall. If you are traveling by the Dubai Metro, take the Red Line to Burj Khalifa Station.From there you can take the F13 bus and get off at the next stop, which is the Dubai Mall Bus Stop. You can see the F13 bus route noted in blue below. If you are interested in seeing more of Downtown Dubai, our Downtown Dubai Tour provides a great overview. You can also walk to the mall via an air-conditioned overpass. This walk takes about 15 minutes, and there are moving walkways (like the type found in airports) to ease your journey. This is our recommendation for how to get to the mall. Once you get to Dubai Mall, you need to walk through the mall to the Lower Ground Floor (also referred to as LG). The ticket office to the Burj Khalifa is within Dubai Mall, near the Subway sandwich restaurant on the Lower Ground floor. The Burj Khalifa has two observation decks. The lower deck is called “At the Top” and stands at a height of 452 meters. When it opened in 2010, it was the highest observation deck in the world. However, this record was eventually surpassed by an observation deck in Canton Tower, China. This prompted the Burj Khalifa to open a new deck called “At the Top Sky.” At 555 meters, it is currently the highest observation deck in the world. The very top of the Burj Khalifa is the 163rd floor; however, this is not accessible to the public. How much do tickets cost to go to the top of The Burj Khalifa? To get to the top of the Burj Khalifa, you need to purchase a ticket. There are several factors affecting your ticket price. Your ticket price will vary based on the observation deck you choose and what time of day you stop by. Prime hours for “At the Top” are usually between 3:30pm and 6:00pm, to correspond with the sunset. Furthermore, you also have the option of booking an Immediate Entry ticket, which allows you to proceed directly to the observation deck without having to wait in line. The table below gives you an overview of the ticket prices. Note that general admission tickets are valid for a specific date and time. Tickets to the observation decks get booked quickly. In order to secure a slot and get the best times, we recommend booking your tickets online in advance. You can also buy advance tickets in-person at the ticket counter. Immediate Entry Admission tickets can only be booked in-person at the ticket counter. These allow you to bypass any lines and go straight to the observation deck. They’re a great option if you were unable to buy a ticket in advance. What happens when I get to the entrance? The Burj Khalifa experience is divided into several parts. When your departure time comes, you will be led to be base of the tower. This walk also provides information on the building’s history. You will then enter the elevator, which travels at an incredible speed of 10 meters per second. When you arrive at the observation deck, you can take in spectacular views of the Dubai skyline. You will also find telescopes that provide a closer look. These telescopes are built with a recored view feature, that shows you what the city looks like during the day or at night. Most people spend an average of one hour at the observation deck. We hope you found our guide to going to the top of the Burj Khalifa useful. If you have any additional questions, feel free to leave a comment. Posted March 27th, 2017 by Stephen Pickhardt & filed under Dubai. The Dubai Miracle Garden is aptly named. After all, growing 45 million flowers in the desert is quite the miracle! The Garden is like an oasis in this bustling city. Here’s what you need to know before making the trip. What is the Dubai Miracle Garden? Dubai Miracle Garden is the world’s largest natural flower garden. It is home to 45 different species of flowers that have been sculpted into impressive and colorful designs. The Garden is great place to simply walk around in. There will be a beautiful display of color wherever you turn your head. Our favorite attraction is the giant replica of an Emirates A380. It is the world’s largest floral installation and is covered in over 500,000 fresh flowers and living plants. Incredibly, the structure even includes moving engine fans. As noted during our tours, Dubai always likes to be on the cutting edge. Is the garden like a park? The Dubai Miracle Garden is a botanical garden, not a park. Because of this, there are rules in place to protect the surrounding flowers. For example, you cannot bring in outside food, sit on the grass or ride a bicycle in the garden. The Garden is located in Dubailand, along Umm Suqeim Road. It is about a 20 minute drive from Mall of the Emirates. For a cheaper option, the Route 105 bus will take you directly from Mall of the Emirates to Dubai Miracle Garden for only 5 AED. The Garden opens at 9:00 am and closes at 9:00pm on weekdays and 11:00pm on weekends. Tickets to the Dubai Miracle Garden cost 40 AED for adults and 30 AED for children between the ages of 3 and 12. Only buy tickets from the official counter. Tickets purchased from outside vendors are not valid. Is the Dubai Butterfly Garden included in the ticket price? No. Although the Butterfly Garden is close to the Miracle Garden, it is a separate attraction that requires its own ticket. Access to the Butterfly Garden costs 50 AED per ticket.